The Emerald Coast in Florida's panhandle is a fantastic region that's full of natural beauty and wonderful people. It's the kind of place that once you visit, you never want to leave. That's why at TrueSouthCoastalHomes.com, we always encourage people to take a trip to the Emerald Coast to see what these communities have to offer. The warmer weather makes Spring a great time to visit the Emerald Coast. Here are four reasons to visit the Emerald Coast this spring, and do a little house hunting while you're here. Destin is known as “The World’s Luckiest Fishing Village,” and there are multiple tournaments throughout the year where anglers can test their luck with a rod and reel. Spring brings the annual Destin Cobia World Championships which is a month-long event that attracts hundreds of fishermen to the Harborwalk Village Marina. The contest is more than two decades old and is filled with history, tall tales, and legendary catches. The tournament begins at the around the end of March, with the first Cobia caught, and weighed-in by a boat officially entered in the competition. It ends in late April or early May, which is when the crowds gather at the docks to find out who the winner is. Even if you can't participate, it's fun to watch the action, and there's always a carnival atmosphere on the last day of the championship. You can take a look at the gallery on the event website to see some images from the tournament’s long history. Even if you're not into fishing, there are weekly fireworks shows from Destin Harbor during the spring, so something fun is always happening. If you need an excuse to take a trip to Destin, the 33rd Annual Sandestin Wine Festival is coming up in mid-April. From April 11th through the 14th in Sandestin Golf and Beach Resort. You can join in the fun at what has been called the "Best Annual Event" by Destin Magazine. Whether you wine newbie or an amateur aficionado, the festival has something for everyone. There will be an official kick-off party, wine tasting events, seminars, a lunch cruise, and more. You can find many hard-to-find wines from a vast selection of types and price ranges. And if you want to stock up on your favorites, you can get discounts from ABC Fine Wine and Spirits Retail Tent. Visit the organizer's website to order tickets for the individual events of the festival. If you’re an automobile enthusiast, head to Miramar Beach, FL during the first weekend in May. From May 2nd to the 4th, the Destin Commons shopping mall will host the Burning Up the Beaches event. Besides being an amazing classic car show, the exhibition shows the strength of the community in the Emerald Coast. The Burning Up the Beaches show also serves as a charity ride to local institutions. The proceeds go to The Arc of the Emerald Coast which helps those with developmental disabilities. During May, Alys Beach becomes a bit more colorful during the Digital Graffiti exhibition. On May 17th and 18th, artists will project animations and designs onto the iconic white walls of the buildings in Alys Beach, FL. The artists are the finalists for a contest, and the winners will be announced at the exhibition. The event features a street party atmosphere with local vendors, food trucks, and more. It's a fun experience for the whole family. You can see some of the works that were shown during Digital Graffiti’s 12-year history in the online gallery. There are a limited number of tickets to the event. If you want to be a part of the fun, you may want to get your ticket now. 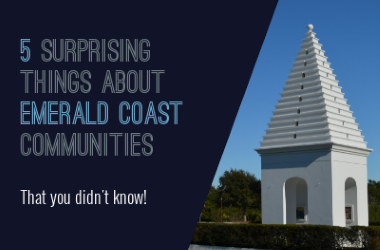 The Emerald Coast is a great place to raise a family, and you can see that in some of the fun, and often free, events for families with children. During the Spring, there is an event, Stories by the Sea, that's produced by The REP, a local theater company. A local theatre group presents a fun, storytelling experience at the Seaside Amphitheater every Monday through Friday at 4 p.m. It's a great way to get to know Seaside, FL and to squeeze every ounce of fun out of a family trip to the beach. If you wanted something to do with your children while visiting Rosemary Beach, the same theatre group is putting on weekly performances of Beauty and the Beast every Wednesday night until Aug. 8th. This performance is another free event sponsored by local merchants, so head to North Barrett Square in Rosemary Beach and enjoy the show. You can't find a better place than the Emerald Coast to raise a family. The Emerald Coast is an excellent place to live. Our coastal communities may be quiet and small, but they are never dull. There is a thriving community here where, and no matter your age, there's always something fun to do. Like we said before, once you visit the Emerald Coast, you won't want to leave. 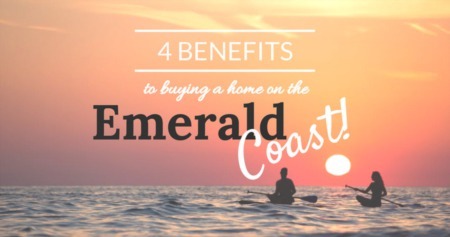 Once you're ready to settle down in the Emerald Coast, talk to us at TrueSouthCoastalHomes.com, and we can help make it happen. Kim is a licensed Florida REALTOR® with Amerivest Realty and specializes in coastal communities on Florida's Emerald Coast from Destin and Niceville to 30A and Inlet Beach.